You can withdraw money at a large number of ATMs around Yangon, including KBZ, CB and AGD bank branches; a number of supermarkets, shopping centres and larger hotels; Bogyoke (Scott) Market; and Yangon airport. US dollars, Euros and Chinese RMB can be changed at most major banks and a large number of money exchanges in the downtown area – or at Yangon airport. If you are downtown and want to change money at the weekend, there are also money exchanges at Bogyoke Market (most shut at around 4pm). Some of the larger hotels also offer money exchange. Internet cafes can be found downtown (particularly around Sule Pagoda) and many hotels and bars offer free wifi with a drink or meal, including the centrally located Sule Shangri-La hotel. Fast 4G mobile networks now cover most of Yangon and other cities; for more information, go to telephone, movile and internet in Myanmar. 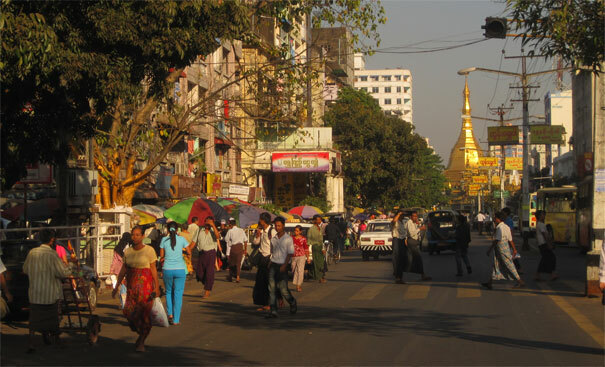 To find detailed information about different areas of the city; getting around; getting to Yangon and getting away; accommodation; eating out and nightlife, click on the thumbnail images further down this page. The government may have moved to the new capital Nay Pyi Taw in 2005, but Yangon (formerly known as Rangoon) remains the cultural and commercial heart of Myanmar, and most visitors begin and end their journey to the country here. Yangon is a huge city, by far the biggest in Myanmar, and its ramshackle charms deserve at least a few days exploration. Yangon had itself only been the capital since 1885, when the British conquered northern Myanmar and moved the seat of government from Mandalay. However, as they had long held the city as a key trading post, Yangon's has a wonderful array of colonial-era buildings - many of which are now crumbling, hidden down side streets. But the biggest concentration is on the riverfront Strand Road, around the bottom of Pansodan Street and Sule Pagoda Road. Yangon’s buildings are also awash with colour and reflect the city’s history of ethnic and religious diversity, but no structure stands out quite like the Shwedagon Pagoda, the monumental golden Buddhist shrine that is sacred to so many in Myanmar. The city also has an eclectic range of museums, art galleries and markets, in which you can take in Myanmar culture and haggle to your heart’s content. The diversity which makes Yangon so architecturally intriguing is also reflected in its restaurants and food, which have plenty of native cuisine but are also heavily influenced by some of the countries that surround Myanmar – Thailand, China and India. The city is one of the safest in Asia, and foreigners are seldom robbed. However, the lack of development that has allowed to retain its colonial charm also means that pavements and roads are in a terrible state of repair, you may have a close encounter with a rat or cockroach, and there is often no electricity. But whatever you do in Yangon, you will find a vibrant and overwhelmingly friendly city that is quite different to any other. Take a look at our YouTube video of Mahabandoola Garden Park in the centre of downtown Yangon. For things to be aware of in Yangon and Myanmar, go to safe travel and security. Martyr’s Day, which commemorates murdered independence hero Aung San and his comrades (July 19th). The week-long festival at Kandawgyi Lake that follows Independence Day (starts January 4th). The colourful and lively Botataung Pagoda festival takes place at the beginning of January and features market stalls and fairground rides, including alarming human-powered ferris wheels (see our YouTube video of the Botataung Pagoda Festival). The pagoda can be found on the riverfront towards the east end of downtown. To find out more about festivals around the country, go to festivals in Myanmar.